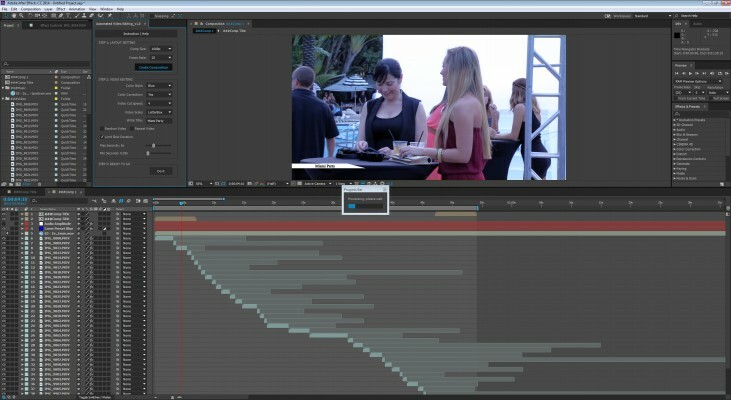 Save time on manual video editing: Promos, Parties, VJ Videos, Wedding and much more. Automatic Video Editing by the music beat (with sensitivity controller). Limit Shot Duration option (Minimum shot duration, Maximum shot duration). Comp Size & Frame Rate adjust. Start of each clip (Random or Beginning). Opacity Dissolve Control (also include the length of each dissolve). Scale Option to all layers in the comp according to the comp size (LetterBox, Crop). Color Correction & Color Style. Support long duration video footage (for example: GoPro footage) and regular short duration video files. Title Animation Generator for opening and closing. 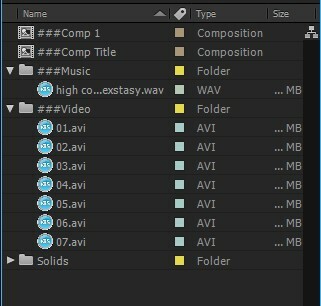 Choose comp size and frame rate, press on 'Create Composition', two comps and two folders will be created (one folder for music, one folder for videos). Import video files into the video folder and import 1 music file into the music folder. Tweak the video editing setting in the UI as you wish and press 'Do It'. it will take a bit to finish the operation depending on the length of your edit, your computer speed and the settings you chose. 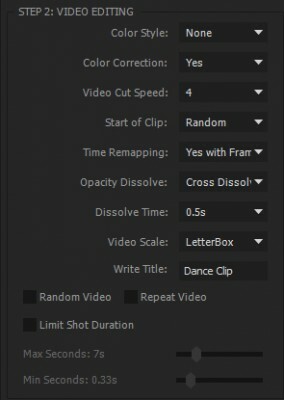 Once the automated edit is finished in and out points for each clip can be adjusted and effects added to create any effect including color correction. Individual layers can also be easily replaced in case you need to fix or change an individual shot. The 1-week free trial version can be downloaded above and is limited to 10 video clips. updated Automated Video Editing to work with the new version of After Effects 2017 (14.2.1.0) for users who use non english version of After Effects. Also now support french version of AE. UI window now support laptop screen resolution. UI window editing features moved to the Advanced Editing Options window. Fixed a bug with the Random Footage option. 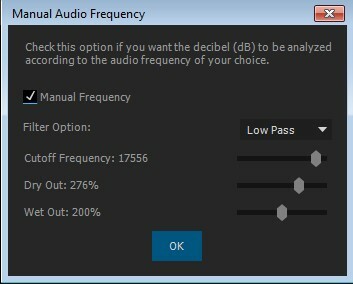 fixed "Stereo Side Keys" message that stop the editing on latest After Effects non-english version CC2015 (13.7). Fixed a bug that might happen if a user choose color style and dissolve transition. 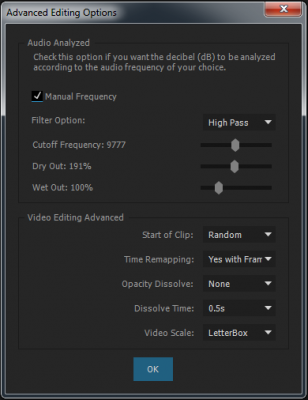 New Features: Default Settings button, Start of Clip control, Time Remapping control, Opacity Dissolve control, Dissolve Time Control, Audio Frequency Control, Video Cut Speed (1 more option), New User Manual. Fixed bug that might happen in the editing process if a song length is too short. Fixed "Limit Shot Duration" to not take effect when unchecked. 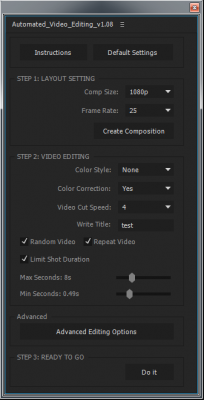 Fixed "Limit Shot Duration unchecked" issue that cause video layers to act unpredictable.